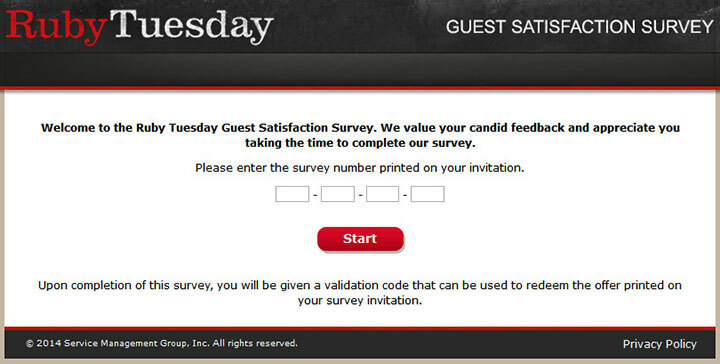 The Ruby Tuesday Guest Satisfaction Survey, found at www.TellRubytuesday.com, is an online questionnaire designed by Ruby Tuesday that helps the company rate customer appreciation. Information from the survey is then used to make improvements by the company for each store. This survey is done online for your convenience. Participation in the survey gives you a way to provide feedback to the company. This information is used by the company to make needed improvements. They cannot make the improvements if they don’t know what needs changed. This is why it’s important to have these surveys. It’s also a great help from you, so they’re willing to provide you a small incentive to help you choose to take the survey. If you look at your receipt, you will see an offer that is available to you if you take the survey. You will receive a validation code at the end to write down and present with your old receipt. Ruby Tuesday is a chain of casual sit-down restaurants that feature American cuisine such as steak, burgers, pasta, ribs, seafood, soups, salads, and appetizers. Most Ruby Tuesday locations are concentrated in the eastern US, since the flagship company was established in Knoxville, TN in 1972. In the past couple of decades, more Ruby Tuesday restaurants have opened up in the Midwest and West. The same company owns Lime Fresh Grill, which specializes in Mexican-American casual dining. The original owner of Ruby Tuesday started the restaurant chain as a sit-down dining choice for college students in the university town of Knoxville. Have your recent Ruby Tuesday receipt that contains an invitation for the survey. Enter the survey number from your receipt and click start. Answer questions. Please read directions and read each question carefully. Your answer should be thought out and honest. Based on your answers, you may be asked extra questions or be provided a text box where you can input extra information. Receive your validation code. There should be a special area on the old receipt where you can write down the code. The code and the receipt must be taken on a future visit to redeem for the offer printed on the receipt.